The Church of St Mary in the large Nottinghamshire parish of Edwinstowe dates from the 12th to 13th century. White's Directory of 1853 notes that Edwinstowe is "pleasantly situated on a gentle declivity 2 miles west of Ollerton". 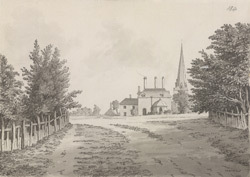 The church is "a venerable structure with nave, chancel, side aisles, tower and lofty spire, which was repaired in 1816, and may be seen at a considerable distance". It is highly ornamented with "turret-looking Gothic niches", and "has annexed to it the chapels of Ollerton and Carburton".